The New Agent's Start-up Plan; Make a Sale in 30 Days! I have some 4th editions of Up and Running in 30 Days. But, the 5th edition is available (at $32.95). So, I'm selling the 4th edition for only $10 plus shipping! Order now, because I have a limited supply. What business would open without a start-up plan? Yet, most new real estate agents stumble through the business for months or years--without a clear focus--without a plan. That's over! Guarantee your success. Implement the start-up plan thousands of newer agents have used to start their businesses fast--and right. What you DON'T need: that full-blown business plan--yet. After all, you're opening your business. Grab the right planning system--the Up and Running start-up plan. This is much more comprehensive than what most people would call a 'business plan'--and, it's created especially for that new or challenged agent. Invest in yourself, and multiply your investment a thousandfold! I loved your Up and Running book!! It is the only thing I have seen or heard of that actually maps out the start-up actions needed for this business. I am looking forward to working with you and learning from you for many years to come." Charlie Lewis Vancouver Real Estate Agent (Washington), Re/Max Equity Group, Inc. I recently wrote a blog post called “confessions of the worst boss ever” meaning that I was the boss and was not treating my real estate business as a business. Now, in my defense I didn’t get it right away. I fell into real estate by accident, literally! I was in a motorcycle accident that left me unable to continue in my 20 year career as a visual merchandiser. Someone suggested I try real estate…great! How hard could that be? Fast forward two years when I finally realized that I had no clue what I was doing! My company did very little to train me and I ended up falling into the trap of looking of that silver bullet. I spent most of my time looking and spending money on some really great systems! Armed now with the knowledge I needed I was poised and ready for action! Or was I? Sadly…no. All dressed up and nowhere to go was the theme for my show. 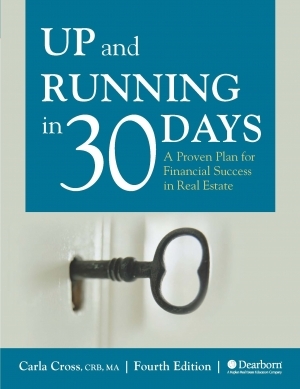 I came across Up and Running in 30 Days (not really sure how, maybe some divine intervention from good ole Mom) by Carla Cross and realized it was the missing link in my willy nillie approach to real estate. A clear “Action Plan” that put things into motion. From the planning of my business to the implementation of systems this was a turn key plan for my financial success in real estate. My confession here is that what I discovered about me through this process is that I really didn’t believe in me…I didn’t believe I could be successful. My biggest fear was having to go back to a JOB! One of the tools that Carla provides is an exercise about negative attitude and how to overcome and revise it. It was so simple I sort of feel silly for ever letting myself talk to myself that way! This year I’m getting back into the game after a couple of years of stepping away from selling and I’m using Up and Running to guide me and things are starting to happen! I’ve picked my niche and have a daily plan to reach my goals. Well for all those out there that are feeling overwhelmed and not sure what direction to take, you are a good agent and you have the skills needed to be successful. What you may not have is a clean action plan , Up and Running in 30 Days IS that action plan. Let’s take this journey together!